Nintendo SNES Classic Mini review: just how good is Nintendo’s retro box of wonders? The SNES Classic Mini does exactly what you’d expect, though in places not as well as you’d hope. Everybody has been talking about the stock situation before all else with pretty good reason, but with the Nintendo Classic Mini: Super Nintendo Entertainment System set to launch at the end of this week it’s finally time to talk about the real issue. You know the one… is it any good? After a few weeks of testing the machine on-and-off, the answer is at once pretty simple and unnecessarily complicated: Yeah, it’s good – so long as you understand exactly what the limitations of the machine are. If you’ve had some experience with the mini NES, you’ll already know what to expect. First up, let’s talk about the shell of the machine: it’s nice! We tested the European model, as you can see in the video below, though I’m reliably informed that the US model is just as faithful to that region’s (very much worse) design. See it, with some size comparisons to current-generation controllers and the like, below. The impressions given in that video hold up pretty much identically a full month later. It’s an accurate-looking recreation of the original SNES that feels good in the hands – sturdy and solid, and not like it’s about to break. This piece of kit feels like it earns its value, at least in terms of presentation. There is one minor snag among all that – as shown in the video, in order to keep the look of the original SNES intact there’s been a decision to hide the controller ports (which still use Nintendo’s proprietary Wii Nunchuk style input) rather than have them out in the open. This has its benefits and drawbacks. It makes the machine look more authentic to be sure, though the door that opens to allow you access to the controller ports runs the risk of feeling more than a little flimsy. In the presence of kids I could easily see this being snapped off or damaged, and that problem is exacerbated some by the fact you’ll be encouraged to sit close to the SNES – but more on all that in just a moment. This is still a lovely-feeling replica of the SNES, however, and I’m particularly impressed by the quality of the fake cartridge slot and the fake eject button, of all things. Usually fake buttons end up looking and feeling like an absolute disaster on these sorts of devices, but here on the SNES mini they really do feel like they could be real buttons. By the way, yes – the controller leads are longer. They’re a little under 5 feet long now, a significant improvement – though still not as long as you might hope. To give a little perspective, the PS2’s controller cables ran at something around 8 feet – so a good way along towards double this length. This is still a huge improvement over the NES mini, however. 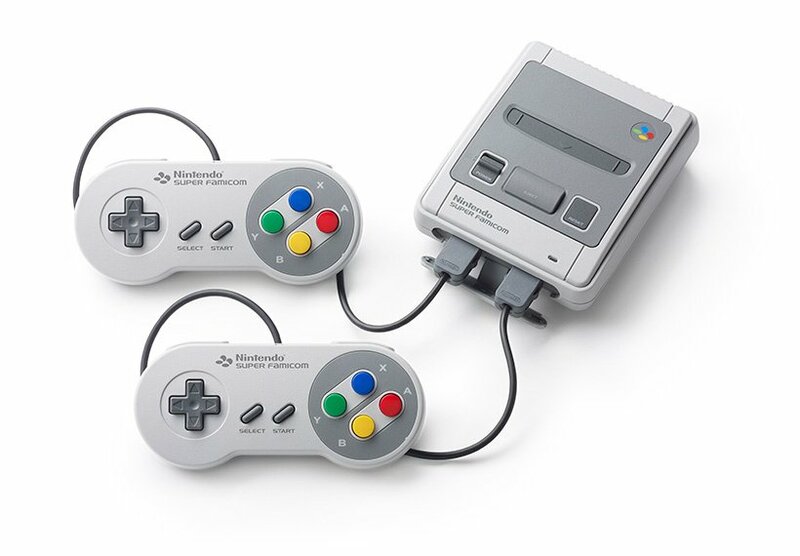 The two included controllers are accurate recreations of the SNES controller, and can actually be used with the Wii or Wii U if you’ve for some reason still got one of those plugged in and kicking around. 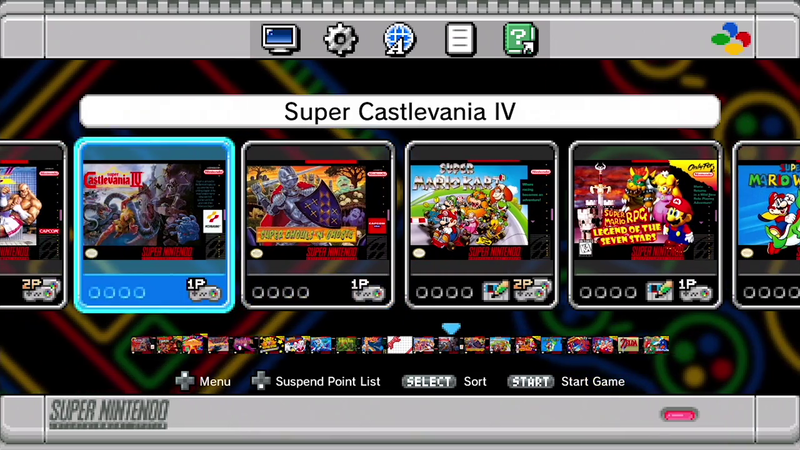 It’s handy for virtual console – which might well actually be the better way to play a few of the games featured on the mini SNES. Again, we’ll touch on that in the next category. Okay, let’s get into the stuff that really matters. Nintendo knows how to make a damn good menu and the mini SNES is no exception – this thing looks lovely, and in a nice touch has been localized once again for each region, with the US menu sporting the purple-trimmed look of their version of the machine. The menu music is as fabulous as you’d expect, though the all-time-best of the Wii Shop Channel still hasn’t been topped. The menu is some nice and simple stuff: left and right scrolls you through the games on the machine, and you can adjust how they’re sorted to shuffle them in alphabetical order, release order, publisher, last played and so on. It’s handy. Star Fox 2, the previously-unreleased big selling point of the collection, has to be unlocked by playing a little of the original Star Fox. Also included is a save state feature, and any time you hop out of a game you’ll be asked if you want to use one to save your progress. Given the SNES is a bit more advanced than the NES saves in-game are a little more common here and work just fine, but save states are available for the few games that didn’t have a battery save on their cartridge back in the day. Perhaps the coolest new feature of all is that you can ‘rewind’ save states by up to 45 seconds, meaning if you fluff a difficult jump you can literally rewind and try again. The game list is pretty excellent, though there are some glaring omissions and the bigger thing to note is that in places and in certain games performance is actually down a little on their performance on the Wii or Wii U Virtual Console. Super Mario Kart definitely stutters more here than on Wii U, for instance, though this might be more accurate to the original SNES version. The SNES has more power and that makes emulation more difficult to nail, and so there are a few more natural, tiny imperfections in the games here than there were on the NES. None of this is game-breaking, however – it’s just a small thing worth noting. Generally speaking performance is perfect and exactly as you remember – but one or two of the games that go nuts with the mode-7 effects and the like to chug a little. As for the game selection – well, really, it’s a great list, as mentioned earlier. There are 20 classics on here plus Star Fox 2, but you’ll still find yourself wondering about some. Why only one Donkey Kong Country? Why Final Fantasy 3 (now 6) and not also 2 (now 4) – and further, where on earth is Chrono Trigger, arguably the best Japanese RPG of all time? Why Street Fighter 2 Turbo rather than Super Street Fighter 2? There are a lot of small questions like this, as with the NES mini, but it’s still hard to criticize – this is a great value package all the same. 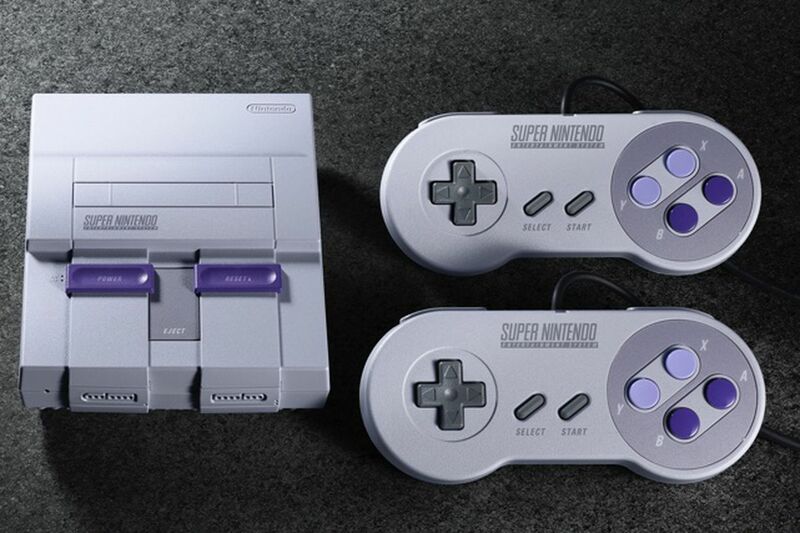 Many of the criticisms you can level at the SNES Classic Mini are the same as were aimed at its predecessor – strange game selections, minor performance issues, supply constraints and no official way to update the machine. These criticisms are still real, though for much of the SNES Mini’s audience they likely don’t matter too much. It is exactly what you think it is, and chances are you already know if you want it. If you’re tempted, just know it’s a quality piece of kit – with that knowledge, you probably already know what to do.